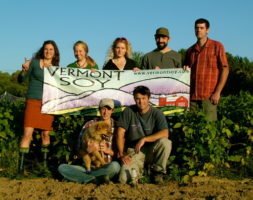 Vermont Soy is a relatively new company, and one of the founders is an organic farmer. While many other soy milk and tofu companies are looking to source overseas or moving away from supporting organic farming, Vermont Soy is actively building a reliable source of locally grown organic soybeans by working with organic farmers in their home state of Vermont to grow organic soybeans. They use only real food ingredients to flavor their soy milk, such as vanilla extract and cocoa powder instead of natural flavors. Their packaging is fully recyclable, as opposed to the cartons used by most brands which are not recyclable in all areas. Their soymilk is also unique in that it is gently pasteurized (as opposed to high-heat pasteurized), which is enough to kill harmful bacteria without exposing the food to excessive heat.